Usually, during the warmer months, long walks on sidewalks and asphalt can trim nails down a bit. However, in the colder months, when the dogs are not out walking as much, nails can often get out of control if they are not trimmed regularly. 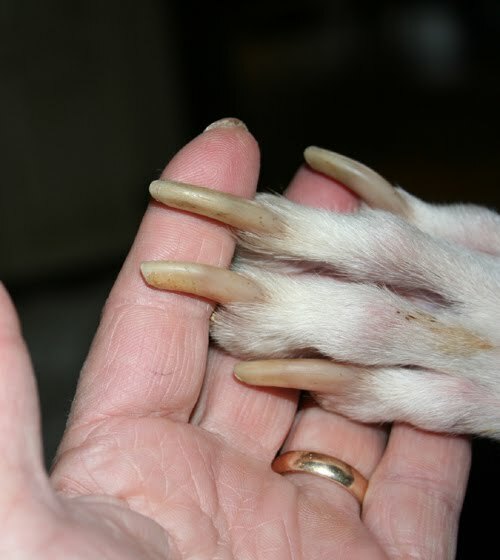 How short should your hound’s nails be? 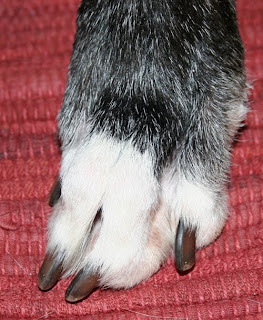 A good rule of thumb is that the nails should not touch the floor when the dog is standing (see photo above). If you hear clicking when the dog walks you need to get the nails shorter. Although it sounds like a daunting job, if you clip often over the course of a month, you can get your dog’s nails short enough that you can do regular trimming without much effort after that. If all else fails and you have a “screamer” that will not allow you to touch his/her paws (some greyhounds actually HATE having their feet touched), then a groomer might be your best bet. Pet stores like Petsmart and Petco are inexpensive and the groomers there work very efficiently. If you take your hound for a nail trim, remember to take a copy of his/her rabies certificate which is required in most grooming establishments. They will keep it on file for you. Considering the cost of vet bills stemming from poor nail care, this may be the best money you spend on your dog!